The Hare represents me trying to write a piece for the Blog-Hippity-Hop that Kim Paige invited me to join. I don’t have a hare photo to use to represent myself here, so how about the top one to the right, showing the very first piece I ever made using metal clay / powder metallurgy techniques, in a lentil-bead workshop. I strung it with lovely cracked-crystal beads that I’d been saving for something special. ‘Twas made in a workshop offered one autumn years ago, and I thought the beads would also be a great lead-in to the wintry holiday season that was almost upon us. I wore it just about everywhere the rest of that year! Note that the crossing-signs are meant to warn drivers, Santas, or hares to avoid collisions. And this little hare, your author here, is in red lights flashing brighter than Rudolph’s nose warning-mode right now: with blogging and seasonal overload on a major collision course. But this in not a race, and that’s as far as I got with the “story” of those characters so I will just add that …. my blog-hop post IS coming. Soon. Well, soon-ish. Really! If you got here via a hop from Kim’s Facebook page or her blog (where I did comment immediately that I might not get a post up today), I’ll note again there when my post is up. As soon as I catch my breath. Or, you’re welcome to just check back here….. Thanks so much for your understanding! In the meantime, best wishes to you for your holiday-season, for any and all holidays you are celebrating at this time of year! On remembering to take photos…. I like photography. A lot. I like taking photos. I buy photos at art shows and such. I frame and hang both kinds of photos all over the place. But, much of the time, I get caught up in what I’m doing, whatever it is I’m doing, and my brain just does not go to, “Hey, stop and take a photo of this.” Even if I’m surrounded by people taking then, and anymore even if I’m at some event where my view is blocked by people holding up their phones to capture it rather than just being in the moment and enjoying the view right then, I still don’t think to do the same thing myself. I go to some events specifically to take photos. Then, I may remember to take a few some of the time. I take thousands each summer at the various garden-related projects I work on, for example, because my role there is often to be the event’s photographer. Until or unless I pitch in to help with some task, and then it takes me a while to remember to clean my hands up a bit and re-grab the camera… On this blog you may have noted, three posts back, that I got so involved in making my woven piece that I forgot to take photos of the process I was trying to record…. Thus, I have no photos of all the wonderful shows and events I mentioned in my last post. I went to, and enjoyed, all of them. And I really should pause my story here to thank all the wonderful people who purchased some of my creations, as well as the delightful ones who just stopped by to say hello. Back to tonight, when my brain did something ever so slightly different: When I saw Samantha Bower step up to take a photo of Adam from Wigle Whiskey at Koolkat Designs, I managed to take a few too! It’s such a great little place, jam-packed full of all sorts of goodies for this season and throughout the year. With Koolkat reinventing itself as the Artsmiths of Pittsburgh next spring (an event I’m really looking forward to, as both an artist and a teacher! ), this may be the last time I’ll think to take a photo there, so I figured I should share here one from tonight. 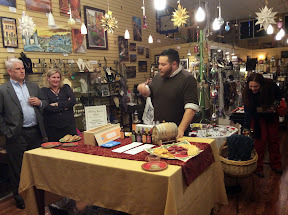 ‘Twas a delightful evening of shopping and spirits along with the rest of the Koolkat crew & clientele.